Western blot analysis of APPL2 Antibody (N-term) Pab pre-incubated without(lane 1) and with(lane 2) blocking peptide in NCI-H292 cell line lysate. APPL2 Antibody (N-term) (arrow) was detected using the purified Pab. 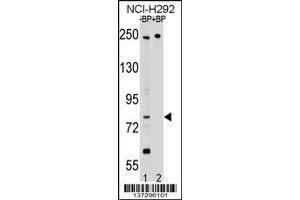 Immunogen This APPL2 antibody is generated from rabbits immunized with a KLH conjugated synthetic peptide between 124-152 AA from the N-terminal region of human APPL2. 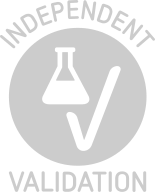 Informationen zur Lagerung APPL2 Antibody (N-term) can be refrigerated at 2-8 °C for up to 6 months. For long term storage, keep at -20 °C.